bought a tie to match. He's thoughtful that way (grin). found and made them better! I will say I am a bit disappointed with the party last week. That means there were a lot of link and runs. That's what partying is all about right? Getting to know the other guests? new found thrift finds for her kitchen. 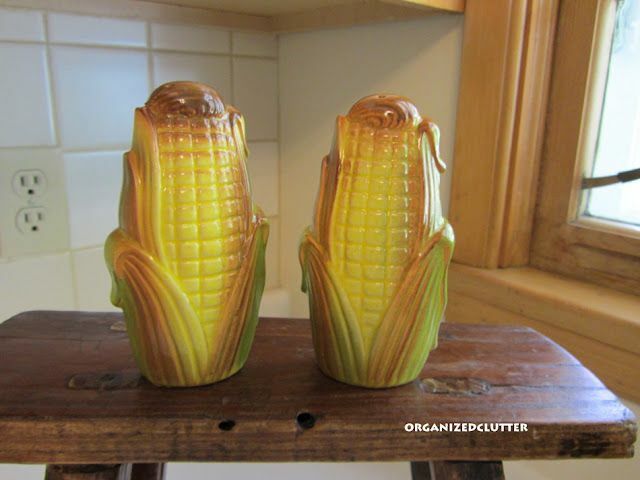 corn on the cob salt & pepper shakers made in Japan! Now, on to this weeks party. 2 Pints (16-oz) - Coconut Cream Concentrate - BUY 1 GET 1 FREE! Thanks Kathe I loved all my veggie S & P Shakers! Well I'm back in the party spirit! I look forward to visiting the other participants and getting some great ideas. Sounds like everything is coming along for the wedding! How exciting! Thank you for hosting and have a great day! Good luck in your final preparations for the wedding!! Thanks for hosting your party. Kathe, sounds like you have the wedding prep under control. Hope we get to see some photos. Hi Kathe, I'm so glad I found your blog over at The Blackberry Vine! This is my first time to link up with you. Thanks for hosting and have a great week! Enjoy your preps for the wedding. Such a special time. Wow this is getting to be the biggest party on the block. Thanks gal for hosting. Hi Kathe! I added a link and visited a few folks. I love you party and thank you for hosting! Thanks for hosting :) Have a great week!